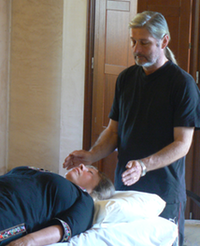 San Andreas Centre for Reiki Training- Reiki in Spain, Reiki Treatments, Reiki Courses. Reiki is a deeply relaxing and healing treatment, activating the body's own natural healing responses. It is useful for all sorts of conditions, helping you to move towards balance and wholeness. Painful conditions such as arthritis, hormone imbalances, genetic conditions, or cancers can all be helped with reiki techniques. It can also be used purely for relaxation, or for the progress of your own spiritual journey. After many years of treating these conditions, I can put together a program of treatment built around your needs. All healings can include specific healing meditations, chakra balancing and past life healing. These are based on individual cases and there is no extra charge for this. Normally for specific conditions three one hour treatments are recommended quite close together, followed by once a week for several sessions. Of course this depends on the severity of the condition, and the convenience of the client. I can make a Journey for you, to include questions that need answering, also Shamanic Healing, this takes between one and a half to two hours, price between 30 and 50 euro, but dependant on what you want to pay and what you can afford. 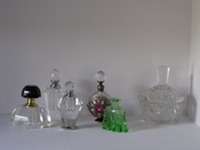 These are always on offer to anyone who is interested. Neuropathic Massage and Aromatherapy are often under estimated, they can be so helpful for many conditions, an internal body workout! Effective in toning the body and nervous system, elimination of body waste through the kidneys, bowel, skin and lungs, improving respiration, blood circulation, relieving pain, easing stiffness, speeding up metabolic rate, delaying facial wrinkles and nourishing the muscles. As well as this physical side, the essential oils used all have their own therapeutic qualities and using only organic oils makes them more efficient in every way, chemically and emotionally. Individual areas that need working on, e.g. Scar Tissue, Tummy after Childbirth, top of Chest, top of Arms or Legs. NatureLift is a unique treatment, combining deep tissue massage and healing. From her experience as a practicing aromatherapist and healer, specialising in deep tissue massage, Julie has developed a technique for the face and neck, combined with Reiki healing. This treatment reduces lines and uplifts muscle tissue. The massage element of the treatment was originally designed for treating scar tissue and burns and takes blood and lymph to as many parts of the skin and muscle tissue as possible, areas that have become dry and lined will have improved tone and elasticity. This prepares the skin and muscle tissue, allowing maximum benefit from the healing which follows. To maintain the effects, a periodic refresher treatment is recommended. NatureLift is totally natural and non-invasive.